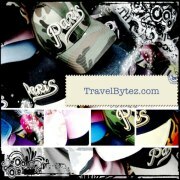 Hotel reviews, travel tips, food, shopping, concerts, photographs of pretty things and basically anything else that comes to mind... Travel Bytez is a cosmopolitan Singapore-based Travel Blog, with elements of Food, Lifestyle, Fashion and much more! While travel has a different meaning to each individual, most people tend to associate the word “travel” with visiting other countries for that sense of adventure and/or to just to relax. Here at Travel Bytez, the word "travel" simply represents a type of freedom that enables an individual to do what they enjoy at anytime and anywhere; learning a bit more of themselves and the world around them in the process. After all in life, each and every one of us travels (e.g. to/from work, school, eat, play and of course that well deserved holiday), and we learn something new everyday no matter where we are. Travel Bytez started off as a place where iceprinxess could commemorate interesting places and experiences. Like its name suggests, Travel Bytez intends to be a platform for sharing useful opinion and information presented in byte (bite) sized portions for you to take your pick, and perhaps inspire your travel aspirations, while at the same time function as an outlet for self-expression (it is a blog after all) as the authors discover the world around them. iceprinxess (pronounced ice-princess a.k.a Abigail) lives in sunny and humid, sometimes (very) rainy Singapore. Perhaps it is the hot and humid weather that inspired the online nickname, even though the irony is she cannot tolerate the cold. She dreams of traveling the world (one day) and encountering interesting experiences. She is fluent in English and Mandarin, and has been wanting to learn another language. With each post, she discovers a bit more of herself and the world around her. She has since discovered that she is not much of a backpacking/camping person, though she can accept being in such conditions, she would prefer to avoid being in such a situation unless absolutely necessary. She does not necessary have to travel in luxury but believes that being comfortable and happy is most important. iceprinxess believes that it is not about spending the least or most money, but trying to maximize what you have and be happy with it. You can follow/connect with her on Twitter or Instagram. She also occasionally blogs about her favorite movies and dramas. DramaQueen is iceprinxess's best friend since elementary school and like the name suggests, she adds the drama to life making it more interesting (at times). When she is free she likes to watch Korean Dramas and attend concerts. She blogs about her favorite movies and dramas at Everything Sweet. We hope you enjoy your stay on Travel Bytez. Please Like Travel Bytez's Facebook Page! Want to advertise, review about a product/service or sponsor trip? We would love to hear from, so please drop us a note at our Contact Form! Invites, advertorials are also welcome and much appreciated! * Do note that Travel Bytez is a personal blog and while we intend to bring you the most accurate information available, it cannot be guaranteed that information on Travel Bytez will not change, and that information may not always be up-to-date. In addition, posts may also contain affiliate links (i.e. discounts etc...). A commission is earned when a product or service is purchased using such a link at no additional cost to you. This helps to offset the cost of maintaining the blog, so please help support us! Please read about Our Policies.